The same teams that competed for the KVAC Class A title at Cony last Saturday will duke it out again this weekend at Belfast. A lot can change in one week, and most notably will be the course. Cony is known as a difficult course while the layout at the Troy Howard Middle School is more like a racetrack. Individually Osman Doorow of Lewiston is heavy favorite to win, Doroow has had an impressive fall that saw him win the KVAC title weekend in dominating fashion. 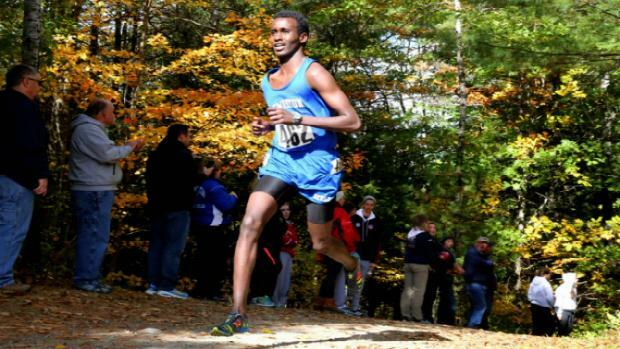 Osman won by 17 seconds, and in the process shattered the course record at Cony by 18 seconds with his 16:38 performance. Earlier this fall at Belfast he won the Festival of Champions in the fastest time in the state 15:50, and if the weather cooperates there is no reason to think that mark can't be lowered down. The fastest time ever recorded at Belfast during the Northern Maine Regional, formerly "Eastern" is 15:46.02 in 2009 by Will Geoghegan of Brunswick. 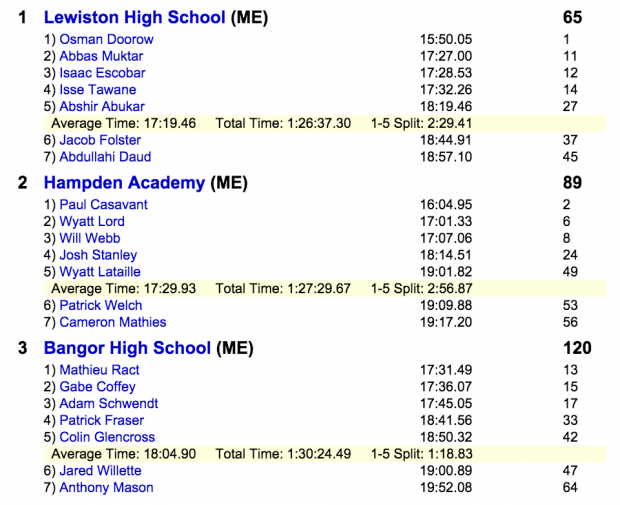 Chasing Doorow will be Paul Casavant of Hampden Academy, the junior was 17 seconds back of him last week at KVACs, and was 14 seconds back of him at FOC. Casavant stated in his interview with MaineTrackXC last week that his goal is to stay with Doorow. If he follows that plan a sub 16 effort could be in the works. Messalonskee's Zach Hoyle has had an outstanding fall, and last week was no exception as he moved up to 3rd place in the final 800m at KVACs. Hoyle ran a personal best 16:41.93 at FOC, and will no doubt be aiming to run faster than that on Saturday. Last year he placed 8th in this meet. Hoyle will be pushed by Edward Little junior Jacob Gamache who was 4th at KVACs, and was ahead of him at FOC by 1 spot. Expect these two to go out with Doorow & Casavant, if they do they could be rewarded with new personal bests. Don't sleep on freshman Wyatt Lord who keeps getting better, Lord was 5th at the KVACs only 7 second back of Gamache. Lord who won the freshman race at FOC on the same course ran 17:12, this time he won't have to push the pace himself he'll have plenty of help, a sub 17 clocking seems to be in the cards if all goes well. Mt Blue's Tucker Barber is one of the most improved runners in the state, a year ago at Regionals he finished 13th running 17:50, just last weekend he was 6th at KVACs running 17:53 on a much harder course. To put that into perspective he was 19:45 at KVAcs in 2014, now improving almost 2 minutes isn't likely to happen but if he improves a minute that would be a sub 17 minute effort. Barber clocked a 17:17.89 at FOC. 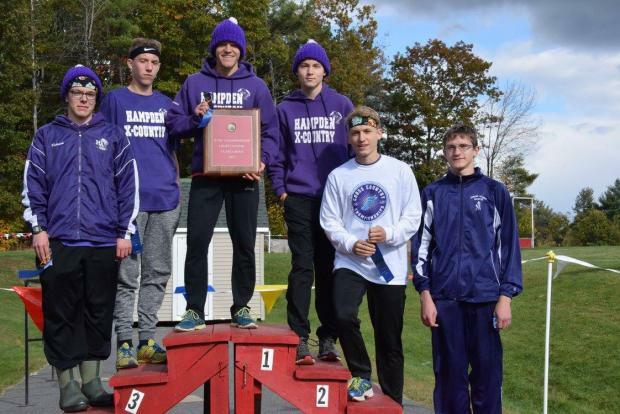 While Hampden Academy comes in the favorite after winning the KVAC title by 25 points over Bangor, don't count out Lewiston who beat both of those teams on the same course at Festival of Champions in early October. The Broncos have earned the title of favorite though as they have front runner Paul Casavant, and a strong supporting duo of Wyatt Lord & Will Webb. This trio is the best in Northern Maine, and if all goes well they will lead their team to the championship on Saturday. 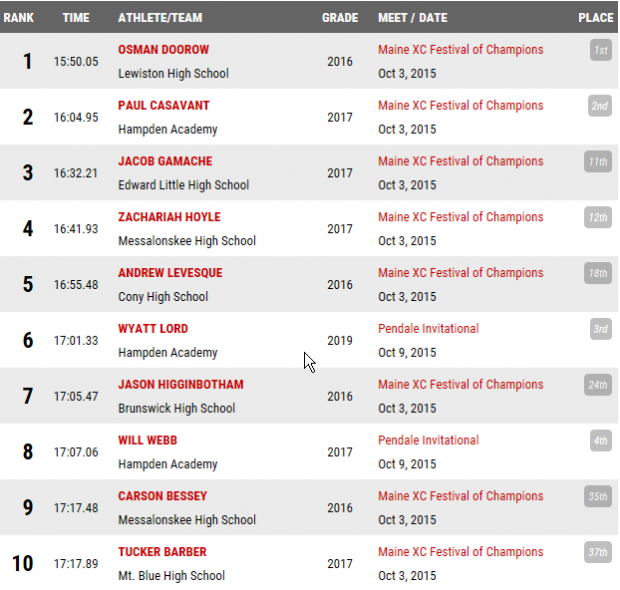 If you go off of fastest 5k times on the season Hampden ranks 2nd behind the blue Devils by 34 points. Lewiston wasn't at 100% last weekend at KVACs as they were missing #3 runner Isaac Esocbar from the line-up. The Blue Devils proved they can run fast at FOC, where they had 4 runners at 17:32 or faster. If they can repeat that type of performance expect them to challenge Hampden Academy for the Regional title. Bangor has come on strong in 2015, and last week they were the KVAC Class A runner-ups. They are the third seeded team based off of 5k seasonal bests. With 13 expected teams that means 7 teams will advance to the Class A State Champions at Twin Brook next weekend. Mt Blue, Brewer, Edward Little, Brunswick are teams most likely to punch heir tickets but don't count out Mt Ararat from spoiling the party. Hampden Academy was the top team at KVACs despite being ranked over 30 points behind Lewiston based on fastest 5k's in 2015, The Broncos will be looking to keep it going on Saturday at Belfast, while Lewiston hopes to bounce back.